We couldn't stretch it out too much..the wind kept blowing it all over! 93x93 inches of gloriously stained, stinky (perfume!) and colorful 8th grader t-shirts quilt is done! Fits a queen bed beautifully with a nice drop of at least 12-18 inches on each side. Blue minky backing makes it absolutely comfy! The picture above was sent along with a few others to the 8th grade parents Friday night. I wanted to make sure that if they didn't like the idea of a bunch of t-shirts on their bed, they could always just fold it so all the memories were tucked up inside at the end of their bed! Did I mention how heavy it was? Why did I want to know? 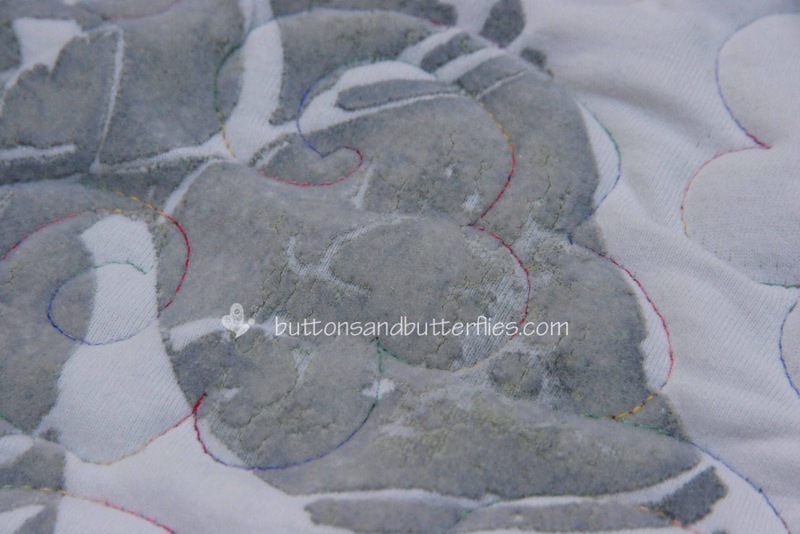 When you spend 10 hrs on your longarm machine and halfway through, the crank stops working when you want to wind the quilt...it makes you wonder! As soon as I unpinned the quilt off the leaders, Ole Betsy groaned in relief and the crank was back in action! I had to get at least a tiny bit of modern fabric on it, so dotted binding was the flavor of the day. Five hours to bind. Ugh. 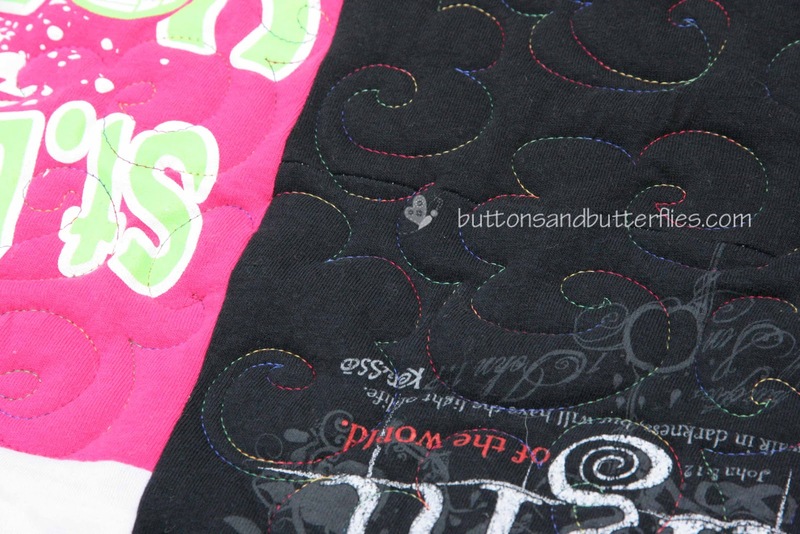 (purchased from sewthankful.com) sewn with a "popcorn" pantograph pattern. Regrets? I should have used an even larger pattern. It was very dense, but I couldn't turn back once I realized it! 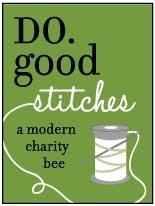 And I am now very "into" making borders for my printed quilt labels. I am not sure if anyone else does this, but I always find a poem, if I can, to place on the label. 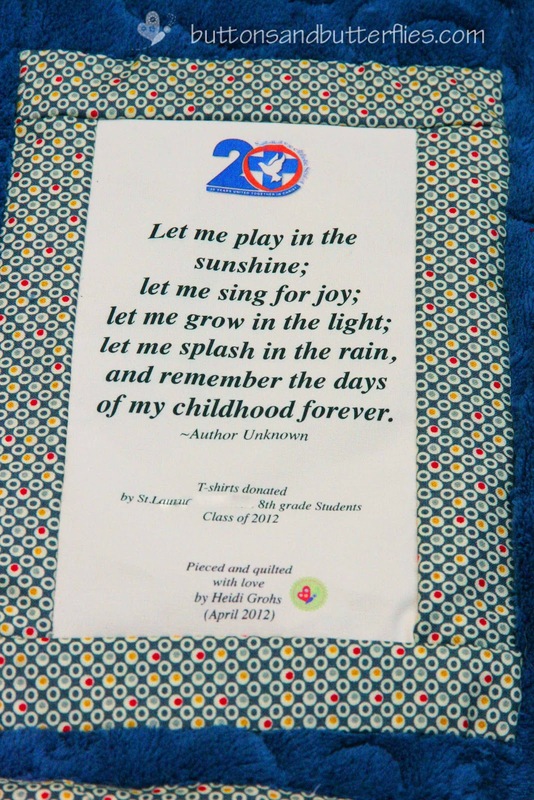 Especially if it an auction quilt for our school like this one. I also added in the 20th anniversary logo to commemorate the special year! 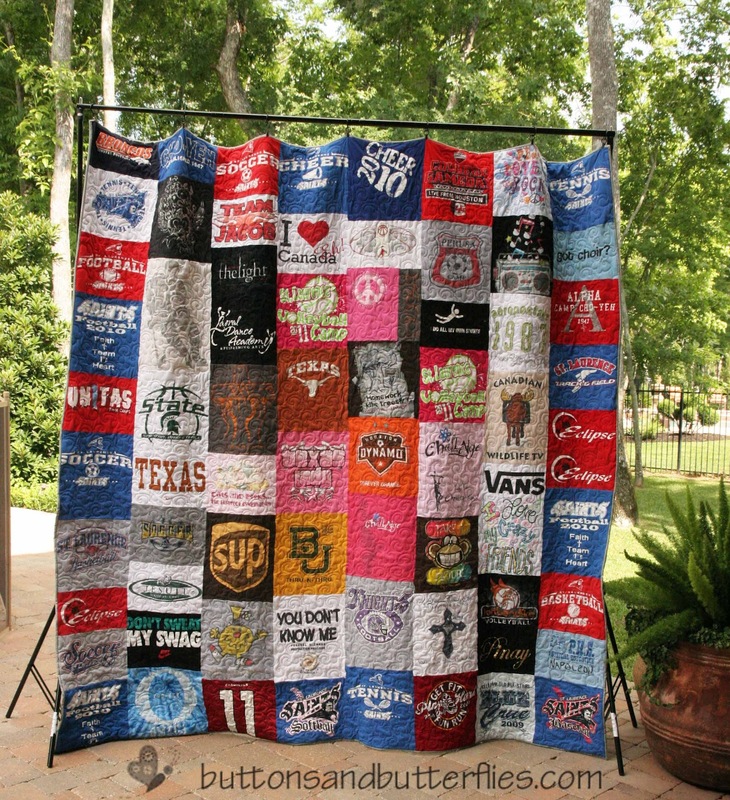 The only thing that I just didn't expect and want to pass on to you, my quilting friends, is the fact that certain t-shirts had an almost rubbery printing on them. It was NOT very friendly with the foot of my long arm machine. I had to slow down, stop and go to get it "unstuck". Sometimes it would even snap the thread. I can say, however, the Pellon Tricot Stabilizer was AMAZING. All 15 yards of it! Yes..I used every single bit of the bolt except for an 18 x24 inch square. A few asked about it and the one thing I must say is to make sure you read the directions that come with it very thoroughly. There is a stretch to the tricot and you must make sure when you fuse it to the backs of the t-shirts, you iron it on the opposite direction of the t-shirt stretch. And you can quote me about the following. I feel confident that I will make more of these in the future....however, minus about 30 or so of the t-shirts. Despite all the planning HERE, and all of the trouble Button caused during this adventure. And thank you for all the encouragement HERE! I am really happy with it! I am anxious to hear how well it did at the auction Saturday night, but it always seems to be a secret! 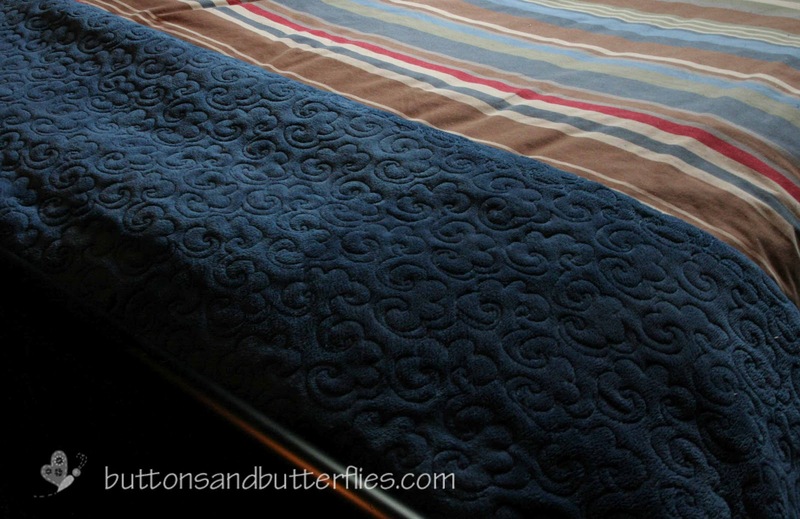 Are you surprised that I have three or four quilts on my mind and already have my studio closet cleaned up and ready to go for some projects? You did it!!!!! Congratulations!! Beautiful quilt...and now..you deserve at least one night of good good sleep!!!! Thanks! Now to catch up on the 400 posts I have in my reader! Or maybe 500 since it is Monday! Amazing job!! That thing is a beast, but I am positive it is going to go to a loving home. Congratulations! You did it! It looks great...can't wait to hear what it pulled in at the auction! Heidi it looks so awesome! What an undertaking. I hope it raises a bunch of money. I like your borders on the label, I usually don't do borders but sometimes a bible verse (if it suits the quilt) and I almost always include a picture. I love the idea of including a picture! 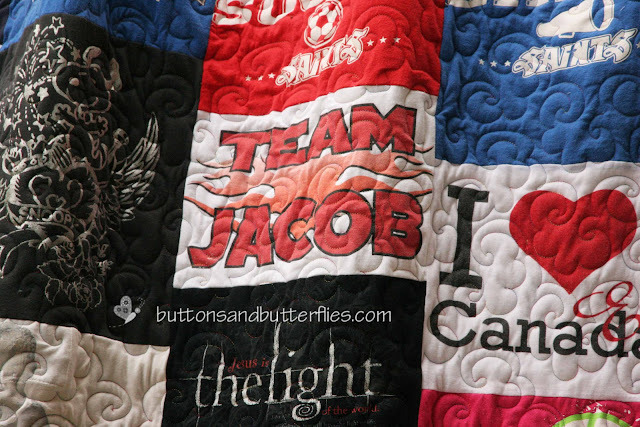 I have only added one or two pictures for certain "event" quilts, but like the idea of doing inspiration photos! 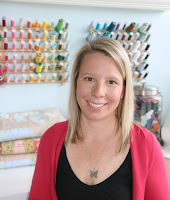 Heidi, you did an INCREDIBLE job on that monster quilt! You should be proud! 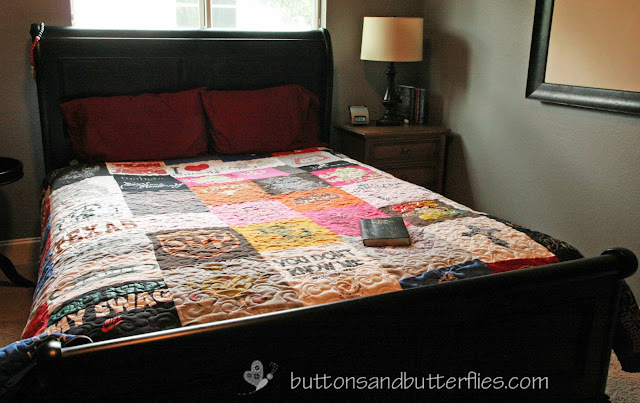 Wow, what a cool quilt, Heidi! You are so talented!!! You are waaaay too nice Beth! Great job. 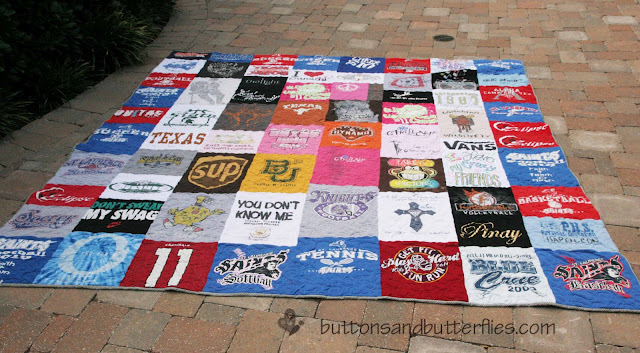 One of my husband's coworkers is saving up his running T's so I can make him a quilt. Thanks for the stabilizer tip! Great job, thank you for sharing. I like the idea of using minky for the back though I've heard it can be difficult to work with. What kind of batting did you use? The minky is VERY stretchy. My recommendation is to not just have an extra 3-4 inches all around, but up to 6 inches extra for the backing! It shifts quite a bit! As for the batting, I just used a thin light cotton batting. I would suggest that you use a thin cotton batting or a flannel if you are using a heavy backing like I did! 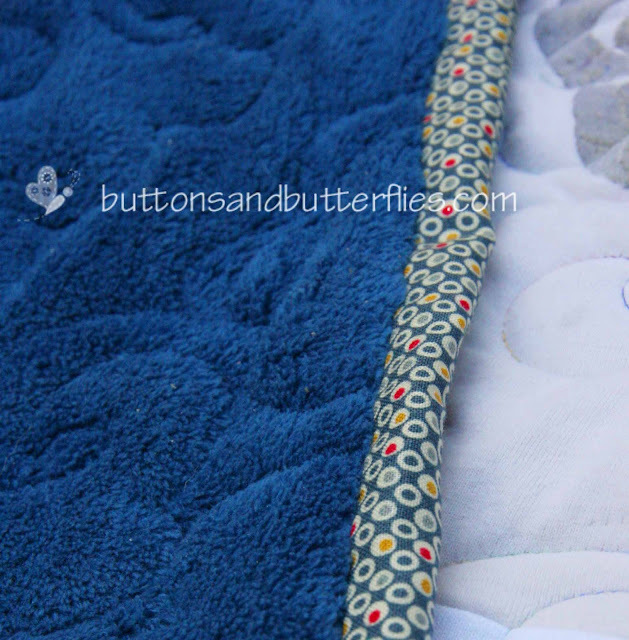 The knit and minky make for a very warm quilt...not much else needed!